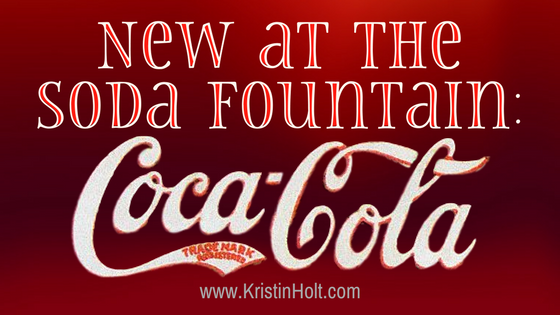 New at the Soda Fountain: Coca-Cola! The Montgomery Advertiser of Montgomery, Alabama on April 17, 1887. Daily Arkansas Gazette of Little Rock, Arkansas on June 23, 1888. Daily Arkansas Gazette of Little Rock, Arkansas on June 28, 1888. 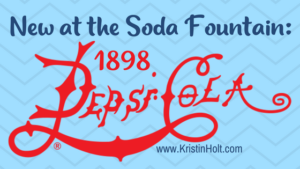 The story of Coca-Cola began in the 1880s with John Pemberton (1831-1888), an Atlanta, Georgia, pharmacist. Among the many tonics and elixirs he sold was a concoction called French Wine of Coca, a wine from the Bordeaux region of France that was laced with a small amount of cocaine, a byproduct of the coca plant native to South America. At that time, the addictive and harmful qualities of cocaine were not known and it was not illegal in the United States. 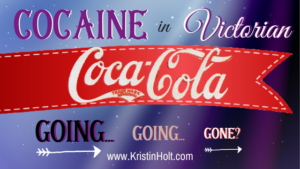 The coca wine also contained caffeine from the kola nut, native to Africa. In 1886, Atlanta banned the sale and consumption of alcohol, so Pemberton revised his formula, removing the wine and adding sugar to make a syrup. Since the sugar made the syrup extremely sweet, Pemberton added citric acid to counterbalance the sweetness. He also added various fruit oils to improve the taste. 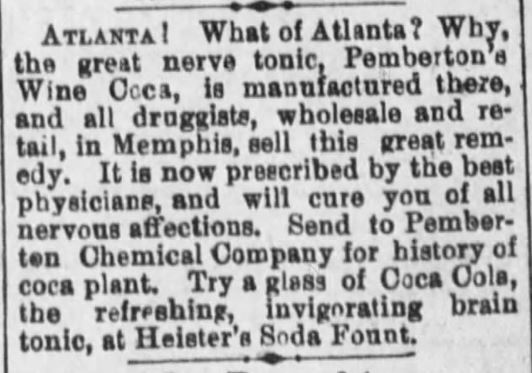 The resulting brew, called Coca-Cola, was advertised as a medicine that would cure all sorts of health problems and sold in drugstores throughout Atlanta. That summer, a customer walked into Jacobs Pharmacy, a drugstore just down the street from Pemberton’s, and ordered the Coca-Cola syrup for a headache. He asked the pharmacist to mix it with soda water so he could drink it on the spot. 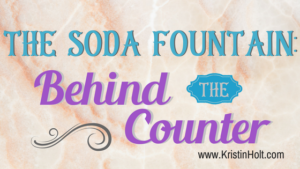 When the customer remarked how good it tasted, a new carbonated soft drink was born. It was first sold at Jacobs Pharmacy in Atlanta for five cents a glass. 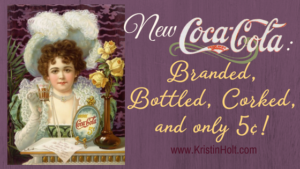 In 1886, Coca-Cola sales averaged nine drinks per day. That year, Pemberton sold twenty-five gallons of Coca-Cola syrup, distributed in bright red wooden kegs. 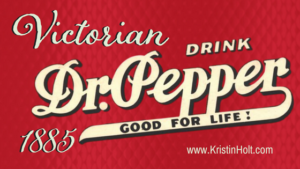 Red has been the color most associated with the soft drink ever since. Memphis Daily Appeal of Memphis, Tennessee on June 3, 1887. 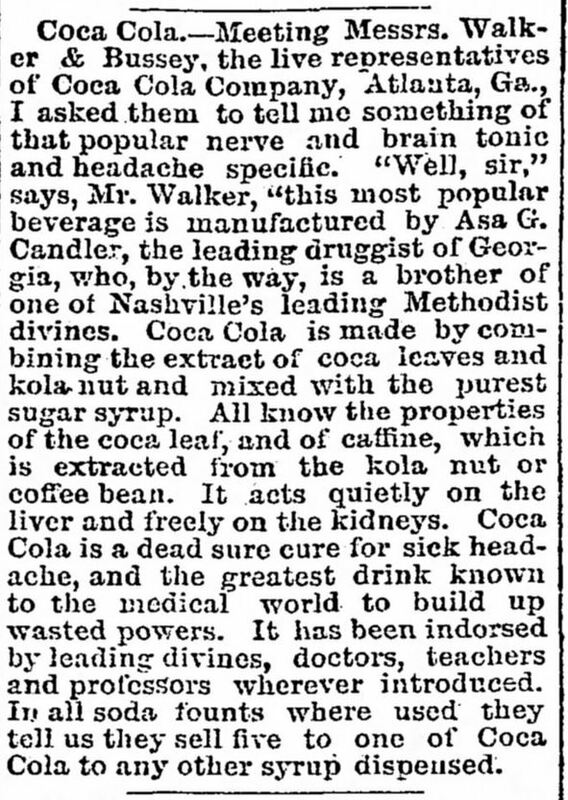 Coca-Cola Advertisement in Memphis Daily Appeal of Memphis, Tennessee, on June 3, 1887. The Tennessean of Nashville, Tennessee on June 27, 1888. Note the advertisement in The Tennessean citing endorsements of leading divines, doctors, teachers and professors wherever introduced. Celebrity endorsements and endorsements of learned men were a common marketing strategy in Victorian-era America just as they are today. 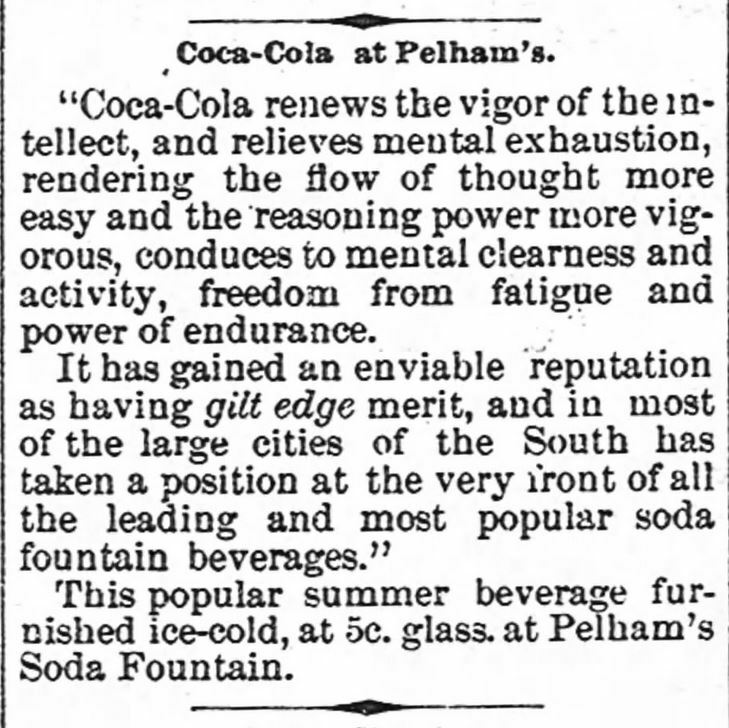 “Coca-Cola renews the vigor of the intellect, and relieves mental exhaustion, rendering the flow of thought more easy and the reasoning power more vigorous, conduces to mental clearness and activity, freedom from fatigue and power of endurance.” The Newberry Herald and News of Newberry, South Carolina on September 4, 1890. 19th Century Coca-Cola coupon. Image: Public Domain, courtesy of Wikimedia Commons. The Wilmington Morning Star of Wilmington, North Carolina, on June 19, 1891. In an earlier quote (Reference For Business, above), we noted that Peberton sold 25 kegs of Coca-Cola syrup (in red-painted kegs) in 1886. 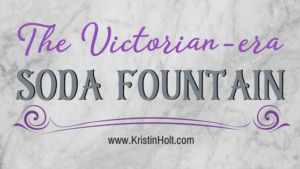 By July of the next year, 1887, Coca-Cola was for sale in Hutchinson, KANSAS, in a soda fountain (vs. the druggist), a distance of one thousand miles from Atlanta. 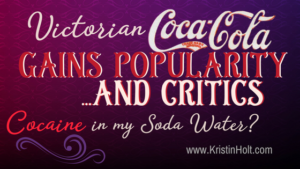 Am I the only one who thinks it’s surprising to see a soft drink (even with cocaine as an ingredient) move that fast in Victorian America? The Hutchinson News of Hutchinson, Kansas on July 13, 1887. Springfield Missouri Republican of Springfield, Missouri on December 6, 1887. Come to the overflowing font at Pelham’s Drug Store and quaff his refreshing Carbonade, rich in fruity syrups. Pelham’s Milk Shakes, Frui-Miz, Coca-cola, etc., are famous for coldness and richness. 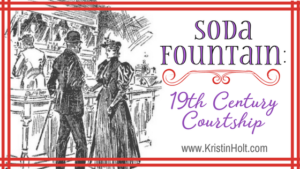 By 1901, Coca-Cola was advertised in a book published for soda fountain owners and operators (The Spatula Soda Water Guide and Book of Formulas). 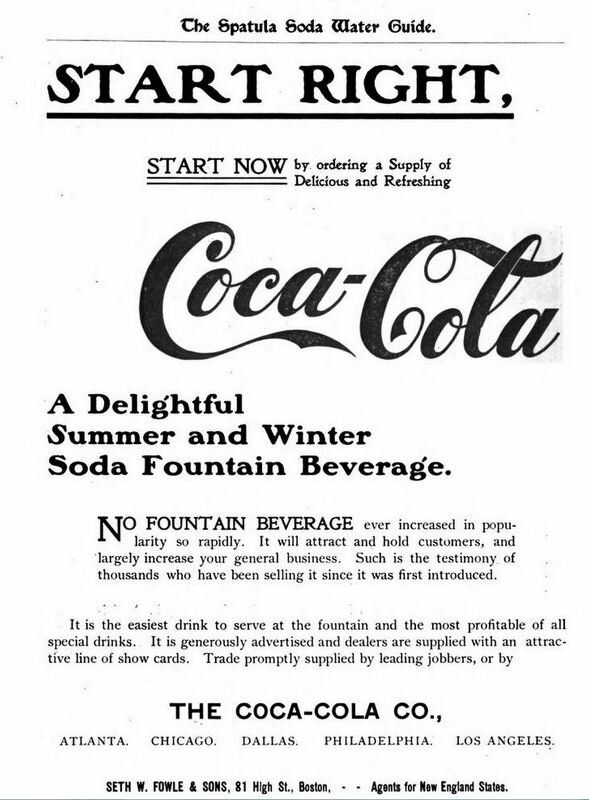 Note the end of the following advertisement that The Coca-Cola Co. had a significant presence in Atlanta, Chicago, Dallas, Philadelphia, and Los Angeles. Seth W. Fowle & Sons are listed in Boston as “Agents for New England States”. Coca-Cola advertisement in back of The Spatula Soda Water Guide and Book of Formulas, 1901. 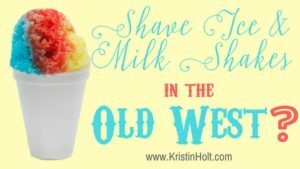 I truly enjoyed your blog post, Kristin! Fascinating! Coca-Cola is my favorite brand of cola. I’m trying to stop drinking much of it, but it’s definitely my go-to when I’m getting a migraine! 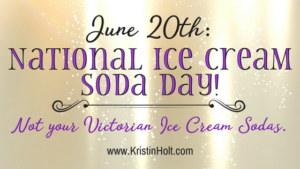 Thanks for sharing such a fun post! 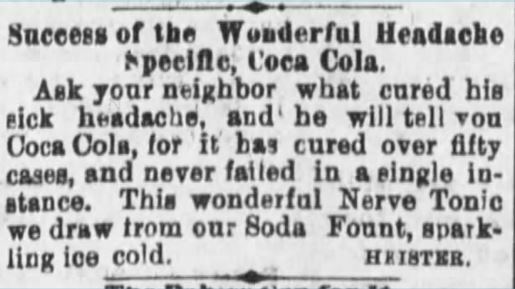 A Coke is still a wonderful go-to solution for a headache, especially those of us with a vascular component to headaches…like migraines. 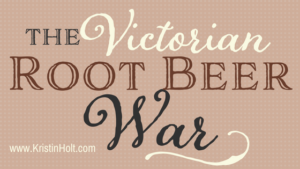 I absolutely love that a “new” treat in the late Victorian Era is still around and such a household name. Thanks for stopping by and commenting!